Elbows. Not just talkin' pasta. Key symptoms and causes of elbow pain, and what to do about them. So we were having a lunch with a friend the other day, an avid tennis player, and we noticed that she was holding her elbow tenderly. Worse, she was wearing a clunky, serious-looking brace (not one of ours) under her shirt sleeve. "No," she said, glumly, "mousing elbow. Physical therapy three times a week, for the next six weeks. Rest and ice." We swallowed hard, as a small niggling pain worked its way up our salad-fork arm. What if we had mousing elbow too? The rest of lunch went by in a blur, as our friend tried to explain, over our small hypochondriac tendencies, exactly what mousing elbow was, aside from a condition caused entirely by too much computer mousing. When we got home, we called our trusty BRD physical therapist, Daniela. She gave us some key information that we wanted to pass on to you. Elbow factoid two: "Tennis elbow" is inflammation or irritation of tendon that connects the lateral epicondyle to the rest of your arm, and it's caused, believe it or not, mostly by forehand swings. It's also caused by your arm and wrist trying to control your swing at the end of your follow-through. Finally, it's caused maybe by just overuse, or something totally unrelated to tennis. Elbow factoid three: Golf elbow is inflammation of the inner, or medial epicondyle, and it's caused by your wrist and arm trying to control your golf swing. It, too can be caused by overuse. Elbow factoid four: It's all in the wrist. Obviously, of these four facts, we paid the most attention to the last. How can something that's obviously pain in your elbow be caused by your wrist? Remember "Dem Bones"? Everything's connected. The same mechanism that operates your wrist also connects later on up your arm. And if your wrist isn't in a neutral position--flat out--you're going to activate either tendon. Which is how Kelley got mousing elbow, an overuse injury, and also the most common type of elbow injury. But Daniela went on to explain that stress on a tendon can take many forms, including constant stress. You know, kind of like when you spend six hours on a bike. Here, too, Daniela noted that it's important to keep your wrists in a neutral position. What's that mean on a bike, though? "You know when you hold your hand up, like in the 'Stop!' position?" she said. "That activates your lateral epicondyle. So keep your wrist flat and your grip loose, and you shouldn't have a problem." The same is true in the opposite direction, she added. 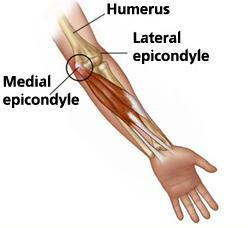 "If your hand drops below your wrist level, you'll aggravate the medial epicondyle." And how stupid would it be to get golf or tennis elbow on your bike? So how to prevent it? 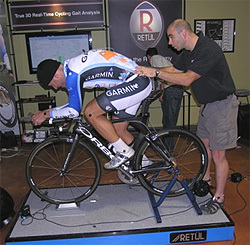 Getting your bike fit properly is one way to make sure your wrists stay neutral. Not operating your bike with a death grip is another. And finally, stretch, says Daniela, and if you have a Wii, use it. What's that? Yeah, we were surprised too. But apparently, the lack of lever on a Wii machine--that is, lack of an actual golf club or tennis racquet, can help, since your body's not struggling to deal with the added weight and swing of your club or racquet. 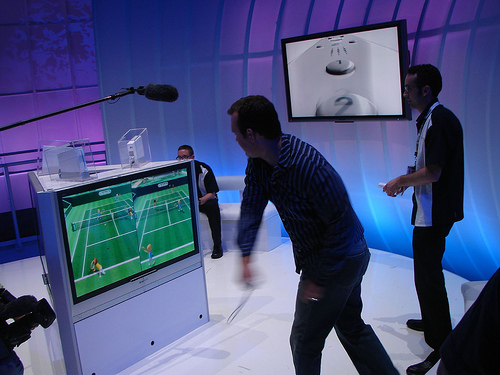 Makes sense to us, and anyway, we've never turned down a game of Wii tennis or bowling. And what should you do if, despite all that, you do end up feeling that sharp pain that's so indicative of an elbow problem? "Rest, ice, compression, elevation," says the good doctor, but a visit to your PT for a set of exercises is in order, and perhaps a change of setup or grip. An elbow support like ours will be be able to help by redistributing the pressure point with a nice cushy silicone pad and basic compression, but the other thing a support does will be to restrict the movement of the muscle itself, so it has time to heal, says Daniela. "Old school, you do nothing, and just let it rest up," she says. "But we've found that that's not the way to go. Limited activity is the newer school of thought, and a good support will help you to maintain that." Stay active but neutral. That's good advice, and we hope it'll keep us--and all of you--from getting golfer's elbow while you're on your bike, or tennis elbow while you're mousing.